JC and I packed up and left Palm Creek yesterday with mixed emotions. We really enjoy our vagabond life style, but we also loved being at Palm Creek this winter and we will return again next year for several months. We are now in Indio, CA, famous for dates among other things! You know how we love to try local cuisine, so JC googled good places to eat in Indio and found El Mexicali Cafe. 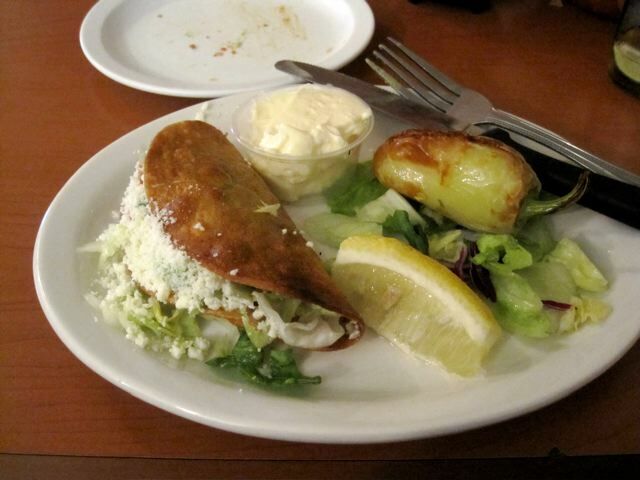 The review said the food was wonderful but it was not a place to take out of town guests - couldn't pass that up!! 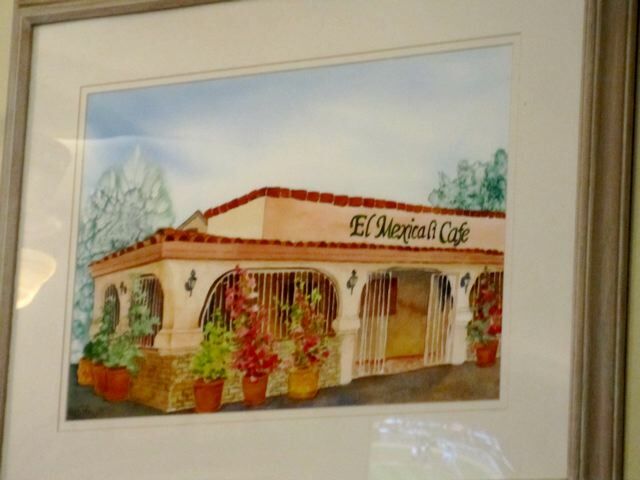 This is not a tex-mex restaurant. The menu leaned heavily toward seafood with a whole fried red snapper as one of the entrees. JC seriously considered that one. But then I spied empanadas on the appetizer menu. I love empanadas but only if the crust is made with masa harina and these were!! Had to have them. There were three on the plate, each with a different filling: queso blanco, shrimp, and a spicy beef mixture. 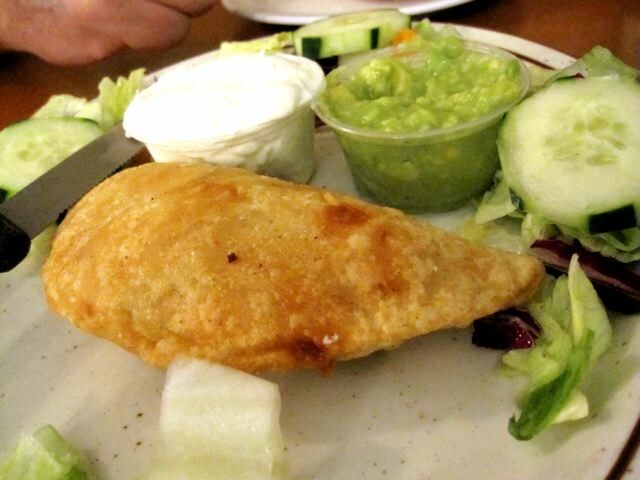 They were very similar to what we used to eat in Venezuela when I was a child. Yummy!! 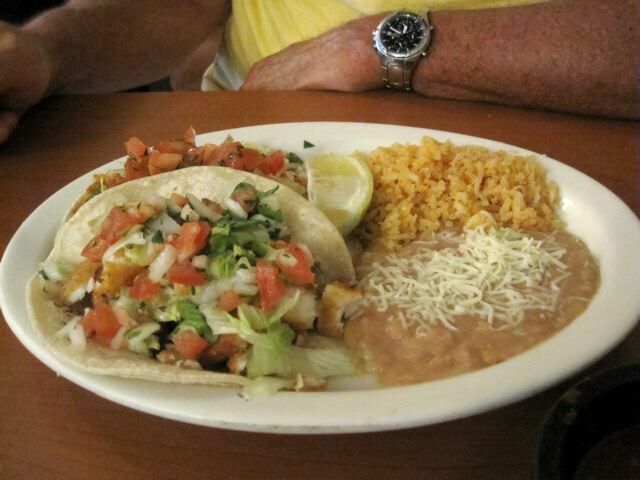 After that indulgence, we weren't so hungry so JC ordered the fish taco plate: two fish tacos (cod we think) with lots of fresh toppings and beans and rice. Very good. 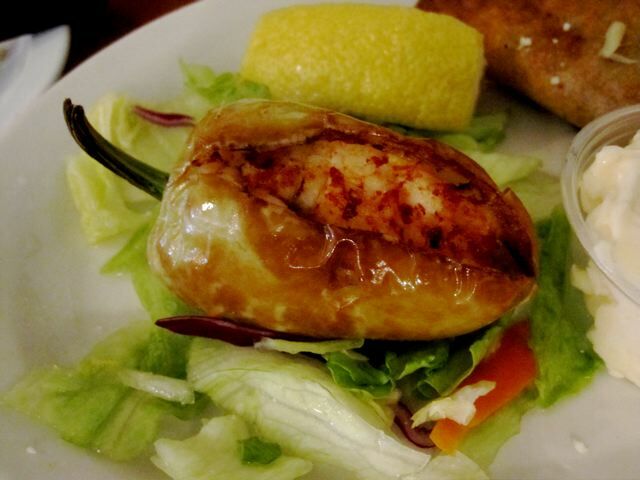 I ordered from the a la carte menu: a shrimp stuffed pepper (wished I'd ordered two or three or . . .). Shrimpy, spicy, yummy! And a crispy taco with carne asada, tender with just the right amount of zing! 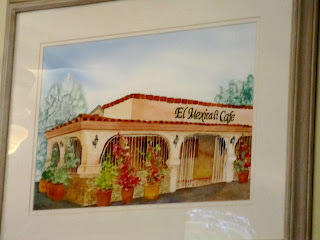 This is an artist's rendition of the cafe, proudly displayed on a wall in the tiny dining room. And this is what it actually looks like from the outside. Not the most inviting place and that, coupled with the very industrial area and the railroad tracks not 40 feet out the back door, earns it dive status. 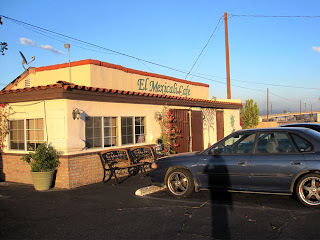 Don't be fooled, this shabby exterior holds a real gem of a restaurant!! The picture and the painting look so similar! Amazing....How was the guacomole? What is masa harina and what makes it so special? Masa harina is corn flour and it just makes a chewy, crunchy crust that is sooooooo good! The pictures are great! Looking forward to more as you make you way back.